At Fox Chase Cancer Center, we strive to strike a better balance between over-treatment of patients with a low risk prostate cancer and under-treatment of those individuals who are likely to succumb to this disease. In 2012, the United States Preventative Services Task Force (USPSTF) made the highly publicized and controversial recommendation advising against routine screening for prostate cancer with the prostate specific antigen (PSA) blood test. Even though prostate cancer is the most common cancer in US men, expected to be found in an estimated 233,000 men this year alone, the motivation behind the USPSTF recommendation was the concern that many men with slow growing prostate cancers who are not destined to be harmed by the disease will be diagnosed and then unnecessarily treated. The controversy regarding the USPSTF’s recommendations stems from the fact that prostate cancer continues to be the second leading cause of cancer death in U.S. men. While many men may not need treatment of their prostate cancer, early diagnosis of aggressive cases may prolong life and prevent unnecessary suffering. At Fox Chase Cancer Center we strive to strike a better balance between over-treatment of patients with a low risk prostate cancer and under-treatment of those individuals who are likely to succumb to this disease. To this end, many patients with low risk disease are offered active surveillance by our prostate cancer specialists. Furthermore, we’ve recently adopted the latest in imaging and prostate biopsy technology to improve the care we can offer to our patients. 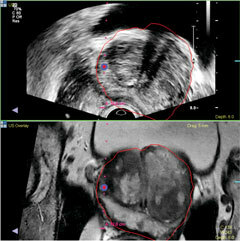 Employing the power of the technique called multiparametric magnetic resonance imaging (mp-MRI), our world-class radiology team can localize tumors within the prostate with a high degree of accuracy, identifying tumors that historically went unrecognized. This technology can give patients piece of mind that aggressive disease is not being missed and uncover aggressive cancer in some individuals with tumors in uncommon and remote locations in the prostate. Using UroNav Ultrasound (US)/MRI fusion technology, which allows precise targeting with biopsy to evaluate lesions found on mp-MRI, we are now less likely to miss aggressive disease and thus potentially minimize the need for repeated prostate biopsies in the future. Furthermore, we can better assure men who choose active surveillance for low risk prostate cancer that an aggressive tumor is not missed or overlooked. Indeed, Fox Chase is one of the first institutions in the Delaware Valley to offer US/MRI fusion capabilities to patients undergoing prostate biopsy. If you or your loved one have an elevated PSA and are contemplating a biopsy, are due for a repeat prostate biopsy for suspected prostate cancer, or are on active surveillance for prostate cancer, we encourage you to consider getting an opinion with our prostate cancer team to see if US/MRI fusion technology can be a helpful addition to your clinical evaluation.